The scene: One of the more unique restaurant stories in the country, Leopold’s Ice Cream has been an on-again, off-again Savannah institution for nearly a century, bringing Southern flair to sweet desserts, by way of Greece and Hollywood. Frequently rated among the country’s best ice cream shops, it was founded in 1919 by three Greek immigrant brothers, who later trademarked their secret recipes as Leopold’s VeriBest. The original Leopold’s closed in 1969 after eight decades, but Stratton Leopold, son of one of the three founders, stored many of the original fixtures while carving out a very successful Hollywood career as a producer and executive at Paramount. In 2004, after nearly 40 years in the movie business, he and his wife returned to Savannah and reopened Leopold’s, this time in a very prime location on Broughton Street, Savannah’s main downtown drag, in the middle of the bustling tourism core – and of course, next to a vintage movie theater. After a decade, the new Leopold’s feels quite old, with its black and white tile floor and ice cream counters set into hardwood cabinetry. It spans two rooms, and the main one has a classic long marble counter down one side where you order and admire the ice cream, plus a second room with additional seating at vintage green marble-topped soda fountain tables. If you order food beyond ice cream, they give you a number, you seat yourself, and the food is delivered. Leopold’s gets every touch right, including serving shakes in old-time oversized Coca-Cola glasses with a plastic cup on the side to hold the overflow. 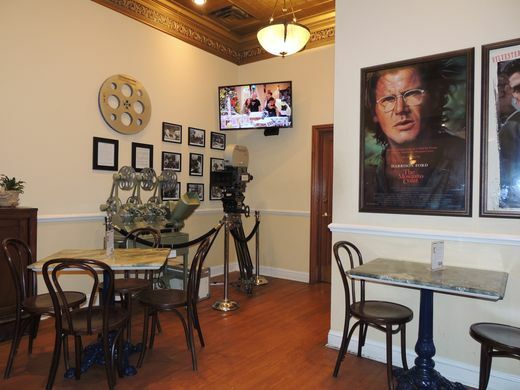 It evokes a bygone era and it should – it may well be the only ice cream parlor in the world designed by an Academy Award-nominated set designer, Stratton Leopold’s acquaintance Dan Lomino. It incorporates old fixtures and materials, plus a sizable sprinkling of movie collateral, mostly posters from the 60-odd feature films Leopold produced, including the Big Chill, Mosquito Coast, Hamburger Hill and Star Trek. Along with props and an old movie camera on a tripod, editing equipment, black and white stills, and autographed photos from celebrity guests including James Woods and Bob Hope. A flat screen in the back room runs related films constantly, and even the bathrooms are done up with movie paraphernalia. The food: They do serve food at Leopold’s, and for many visitors it is a place to have lunch and dessert, but ice cream is definitely the main attraction. The rest of the menu is sandwiches, soups and salads. While limited, everything is made very fresh and tastes that way, with the signature being from-scratch soup of the day, occasionally Leopold’s famous shrimp bisque, a Southern coastal favorite. This is big-time shrimp country, the land of shrimp and grits and other related dishes, so not surprisingly the signature sandwich is shrimp salad, served on toasted whole wheat bread with a choice of sides that includes chips, house-made pasta salad or carrots. The pasta salad is simple but refreshing, especially in Georgia’s summer heat, tri-color rotini tossed with finely chopped red onion and green bell pepper, in a light vinaigrette. The shrimp salad is very fresh and has a lot of small local shrimp, and unlike many inferior versions, it is not overly mayonnaisey, or mayonnaisey at all. It’s chunky with a thick creamy and herby dressing that clings to each crustacean, so it ends up as essentially a big pile of well-seasoned creamy shrimp with lettuce and tomato. It’s quite good, but hardly a destination dish. That would be the ice cream. There are two ways to experience the frozen concoctions: eating or drinking. The shakes are very popular, very generous and excellent. They achieve the hardest feat in the shake world, being about as thick as possible while remaining actually drinkable. If you love shakes you will love these, though unlike many modern shake specialists, they stick with classics like chocolate rather than adding peanut butter cups and offering complicated varieties. The ice cream itself is all made daily on the premises, and there are a couple of signatures, perhaps none more famous than Tutti Frutti, a concept that was invented here in 1919. The ice cream itself is lightly strawberry flavored and light pink, and contains nuts and rum, but the real secret is candied fruits, including pineapple and cherries. It’s a like it or hate it flavor, not my personal favorite as I don’t love candied fruit, but some people swear by it. It is certainly unique. Another house specialty is Chocolate Chewies and Cream, which as the sign says, combines two Savanahfavorites. I could taste the cherries but couldn’t figure out the second local addition until I tasted it, and the flavor has not just chunks of fudge brownie (the “chewies”) in the rich cream-flavored base, but also pecans, a beloved Georgia nut. It is chock full of both so you get something good in every bite. But if you like pecans, the Butter Pecan, with fresh Georgia nuts, is the most intensely nutty I have ever tasted, and in college I managed an artisanal ice cream parlor where butter pecan was one of the best sellers. This is a righteous take on the genre. Overall, Leopold’s is old-school ice cream, winning with high quality and well-chosen ingredients and combinations, rather than with the ultra-rich high butterfat content of today’s super premium ice creams. For that reason I recommend skipping the plain single flavor varieties and going with more complex combos, because the ice cream itself wows less than the sum of its parts. There are always about two dozen regular flavors, plus a slate of seasonal specialties such as an autumnal Pumpkin Spice and some amazingly unique varieties including Japanese Cherry Blossom, Huckleberry Cheesecake and Chatham Artillery Punch Sorbet, whatever that is. Pilgrimage-worthy? : Yes for ice cream fanatics and a must-try dessert stop for other Savannah visitors.